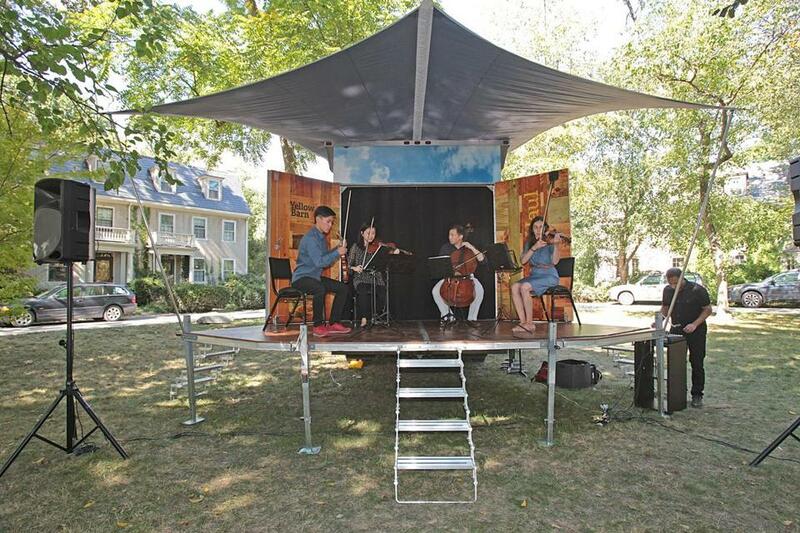 A stage in the back of a U-Haul (paid for in part by Fresh Sound Foundation) allows the Grammy Award-winning Parker Quartet to perform anywhere. Classical musicians who believe their music will bring a blessing to whoever hears it have been presenting in offbeat locales in the Greater Boston area. Tomorrow, too. Malcolm Gay has the story at the Boston Globe. “The 17-foot U-Haul truck sat parked in an empty field, ringed by trees. With the touch of a button, a roof-mounted winch whirred into action, unspooling cable as a fan-shaped stage lowered like a drawbridge from the rear. The U-Haul’s modified rear doors acted as a band shell, flanking the stage to project sound, and a custom-made sail, supported by deep-sea fishing rods, projected as a visor from above. “Fifteen minutes later and the vehicle, dubbed the Music Haul, was a fully functioning stage — a 21st-century gypsy caravan that will bring live performances to the streets and schools of Greater Boston, Sunday through Tuesday. “Its creators say the Music Haul’s main mission is to bring world-class concert performances to the most unlikely of places: schools, underserved neighborhoods, hospitals, perhaps even prisons. What a good thought! Reminds me how you can suddenly start seeing the pictures on your walls again if you move them to a new location in the house. Read more about this enchanting initiative here. Chris writes at the blog for Our Backyard Rhode Island, “Where else but Our Backyard could you walk to dozens of parks in just one day? Today 32 temporary parklets have sprung up in Downtown, the West Side, and the East Side of Providence to mark PARK(ing) Day. 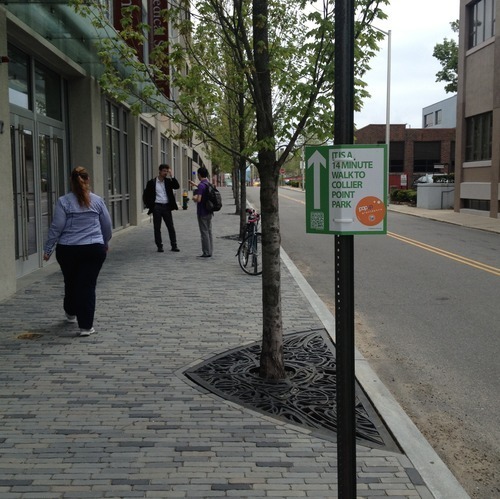 More than 30 metered parking spaces have been transformed into temporary public parks. Designers worked with local businesses to find creative ways to add green space to the urban environment. They trucked in plants, Astroturf and picnic tables to create alluring stop offs for people out for a walk. Walkability greatly improves the quality of life in a town or city, a precept our country lost track of for many years. I grew up in exurbia, where there were no sidewalks. And although I loved walks in the woods, I always felt a little gypped by the ads in comic books starting, “Be the first on your block …” What was a block? As an adult, I have lived only where there are sidewalks. Suzanne and I began noticing signs in Providence a couple months ago, but it was only recently that some folks behind the effort blogged about it. 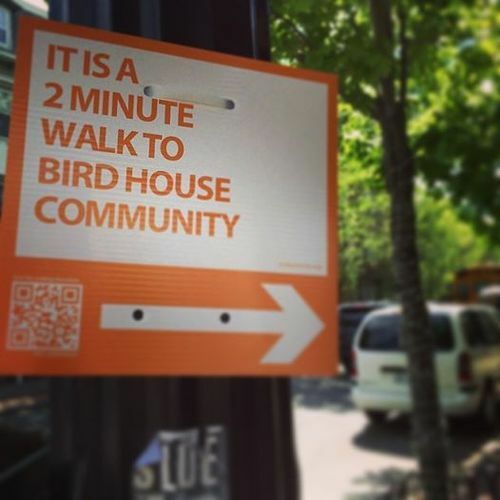 “Providence, RI, is playing host to two Walk [Your City] campaigns — both intended to activate public space and promote active transport. The New York Times recently printed a lovely collection of pop-up music sightings by various reporters. Each unexpected free performance affected New Yorkers like a flash mob. Another report notes, “The High Line elevated park does not normally allow group walks or amplified sounds, but it made an exception for ‘The Gaits,’ one of a dozen participatory performances that constituted Make Music Winter. “The event was an offshoot of Make Music New York, a festival of hundreds of concerts that occurs in June on the first day of summer, in public spaces around the city. Modeled after Fête de la Musique, an annual affair in Paris started in 1982, the New York version is in its sixth year. Several delightful Winter Solstice music events are described here. 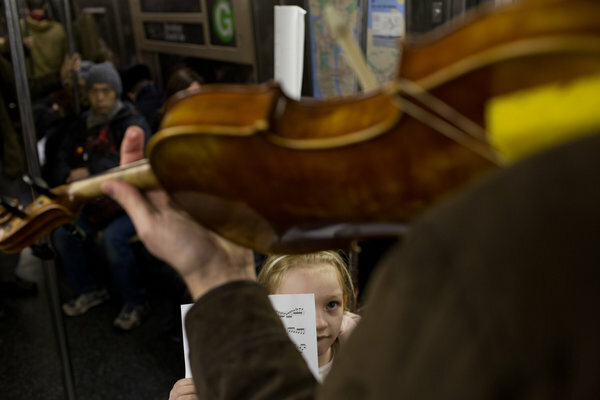 Meredith Krinke, 6, holds Bach sheet music for her father, Brian, December 21 on the G train in New York.